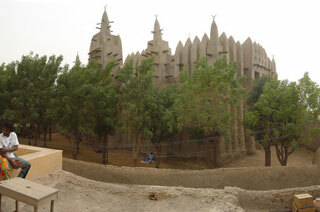 The Grand Mosque of Mopti (also known as Komoguel Mosque) is located in the city of Mopti, in the Mopti Region of Mali. The mosque itself consists of a covered building and a courtyard, as well as a 2-3 meter tall protective wall. Construction of the mosque began as early as 1908. This article uses material from the Wikipedia article "Grand Mosque of Mopti", which is released under the Creative Commons Attribution-Share-Alike 3.0 License.